His parents kept him the name as "Vishnu Siththar". He heard lots of stories of Sri Kannapiran from his parents and because of this, he got attracted towards Sri Vishnu. In the early days of his life, he learnt all the Vedams. Both of his parents were also had a great bhakti towards Sriman Narayanan. And like them, Vishnu siththar was also very much attracted by Sriman Narayanan and his Gunams. So, he started to dedicate his life to Sri Vishnu. He selected to dedicate Garlands and flowers to the Perumal. 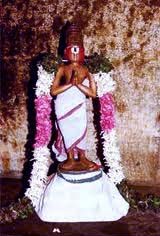 He considered Sri Vadabhadra Saayee Perumal as "Sri Kannan" and started to perform Nandhavana (flower park) Kainkaryam for him. During the time of Periyalwar, Madurai (belonged to Pandiya Kingdom) was ruled by the king named Vallabha devan. He conquered lots of kingdoms in North and the chola kingdom also. As a routine, he dressed in another way to find how is ruling and how are the people of his kingdom. While passing through a house, he saw an elder person sitting in front of the house. The king had a great doubt how to overcome this birth and what to be done to be good in the next generation. As the person in front of the house seemed to be brighter, the king thought he is the right person to be asked and he can find the solution from him. Aariyalbhu adhanaal immai thanniley marumaikku eettum". The necessary things for the night, should be found and searched in the day time, The thing for the rainy season, had to be found and saved during the sunny seasons; thing needed for the older age should be saved in the younger age itself; like that, to be good in the next birth, we should be good in at present birth like help others, follow our rules and regulations etc. If we are good and follow the said rules according to our religion, one can attain all the things what he wanted in the next birth". After hearing this, the king wanted to know what is the thing he wanted to perform for the betterment of his next birth. Selva Nambi worked as a prohithar in his kingdom and said one has to explain that the person has to explain the Vedanta parathuvam. On hearing this, the king ordered to tie a silk cloth which had lots of precious ornaments, jewels etc which will be given to the person who explains the Parathuva siddhantham. During that time, Sri Vishnu emerged in the dreams of Vishnu siththar and asked him to go to the palace of pandiya kingdom and explained the truth for paraththuva siddhantham. As said by Sriman Narayanan, he marched towards Madurai and reached the palace. Selva Nambi could see the glow on the face of Vishnu siththar so he went towards him and greeted him. Then, he started to explain about Paththuvam and he said that for every action to be performed there is and should be a reason. The entire world to lead its life is god; and the paramporul the Paramathma is Sriman Narayanan and we can attain him only through our dedicated bhakti; the final step of bhakti is "Saranagathi". So, if one surrenders all of his ego, wealth, anger and dedicates bhakti means he is getting Saranagathi towards Sri Vishnu which is the only way to get out of all sins and attain Mukthi". Om hearing this, all the great people who were in the palace and even the Pandiya king fell towards Vishnu sittar and gave the prize money to him. After this, the king himself wore the silk cloth on him and gave him the special name "Pattarbiran".